Continuing its good tidings, the Hirshhorn Museum in Washington, D.C., just announced a special acquisition: As disclosed in an article I wrote for The Art Newspaper, which was published last week, the Hirshhorn has bought Yayoi Kusama’s very first Infinity Room, called Phalli’s Field, which she made in 1965. The acquired work is a reconfiguration of that piece–whose elements were taken back to Japan and the piece deconstructed long ago. Kusama reconceived it for the international traveling exhibition of her Infinity Rooms, which was organized by the Hirshhorn. Read the entire story, which is fairly short, here. The 2017 reconfiguration of Phalli’s Field took what had been shown in open space and put it in a room, like the Infinity Room pieces that followed it. As I alluded in the opening line of this post, the Hirshhorn benefited from the Kusama show, not least because it raised the museum’s profile in both Washington and around the country. It enabled director Melissa Chiu to attract new trustees, who–it is to be hoped–will provide more support for the museum. And it helped push the museum’s attendance to a record last year, past the 1 million mark. “[Kusama] and her work attracted visitors that had never come to the museum before,” Chiu told me. That all got Chiu thinking: Since Kusama has such a great impact, Chiu decided to acquire this piece, and she spent the museum’s own money–it was not a donation–on it. 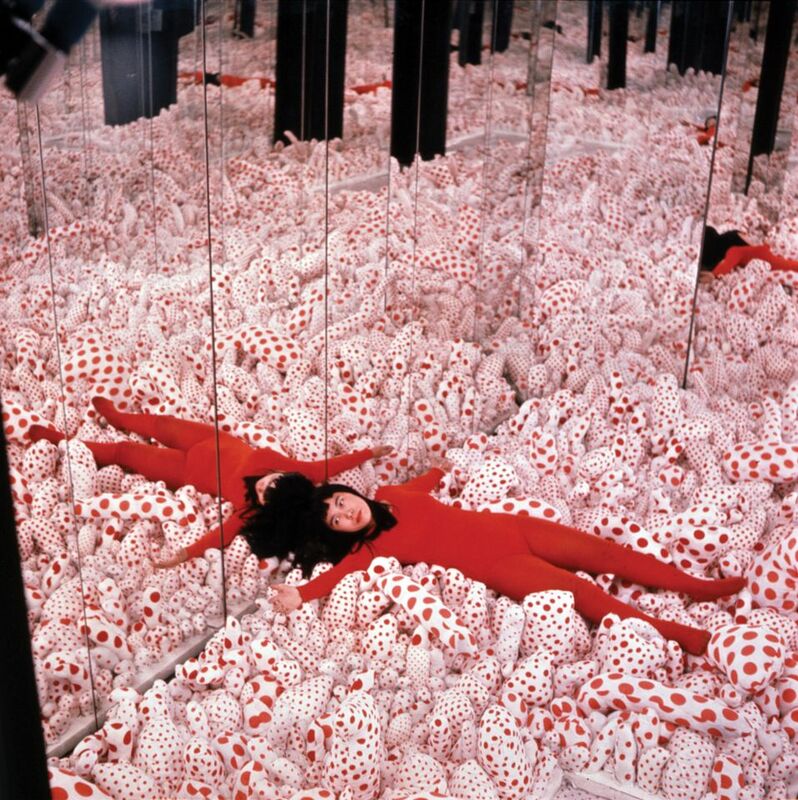 The idea for the mirrored room seems to have occurred to both Kusama and Lucas Samaras at almost exactly the same time, although independently from each other and toward different aesthetic ends. Samaras’s Mirrored Room is dated 1966 but was apparently conceived in the form of small mirrored models dating to 1960-61. It is in the collection of the Albright-Knox Art Gallery where it has long been among the museum’s most beloved and popular art works. Samaras described his intentions in the museum publication, “Contemporary Art: 1942 – 1972″: The reason I used a cube rather than any other geometric configuration was to minimize the number of planes that would reflect the space enclosed therein but still give a convincing illusion of perpendicular extension in every direction.” Joe Hirshhorn and Seymour Knox had a friendly collecting rivalry back in the day, and it’s interesting/amusing to see that the two institutions continue to reflect each other’s tastes–like the mirrored rooms themselves!